The Strategic Planning Advisory Committee (SPAC) is seeking input from the campus community. SPAC has been meeting for more than a year on Truman’s new strategic plan, which has been titled “Affirming the Promise: A Bridge to a Third Decade of Excellence in the Liberal Arts.” A copy of the Executive Summary and a separate listing of the Planning Goals and Initiatives are available on the SPAC Web page at http://spac.truman.edu/resources/index.htm. Earlier versions of these and related planning documents were shared and discussed at last year’s University Conference as well as the Strategic Planning and Assessment Workshop. Three public forums have been scheduled during the next two weeks as outlined below. Faculty, staff and students are encouraged to attend one of these sessions to learn more about the plan and to provide feedback. In addition, the upcoming University Conference will also include a major session and breakout sessions on the plan – hopefully including feedback received as part of the public forum process. The committee will have open forums from 10:30 a.m.-noon Jan. 26 in Violette Hall 1000, from 11:30 a.m.-1 p.m. Jan. 29 in the Student Union Building Alumni Room and from 3-4:30 p.m. Feb. 1 in the Student Union Building Conference Room. As part of this effort, a short Web-based feedback survey has been developed on which you can anonymously share their thoughts and suggestions about the plan. SPAC members encourage people to complete the feedback survey after you have attended one of the forums but prior to the University Conference which will take place Feb. 7. The form can be found at http://itssurvey.truman.edu/Surveys/TakeSurvey.aspx?surveyid=1054. Users will be prompted to log on; the user’s ID will not be attached to their answers. Once the campus community has had a chance to comment on the draft strategic plan, the document will be revised as appropriate and then shared with Faculty Senate and Staff Council for their comment. We hope to have this entire process completed by early spring so the document can be reviewed by the Board of Governors in either April or June. Truman will hold its 20th annual Student Research Conference April 3. The conference is a Universitywide celebration of student research, scholarship and creative achievement in all disciplines. Undergraduate and graduate students in all divisions are invited and encouraged to present their scholarly and/or creative work. All presenters are required to submit their abstracts online at http://src.truman.edu. The site is now open and the deadline for submissions is Feb. 9. A copy of the information submitted will be sent to the student presenter’s faculty mentor for approval. Scheduled classes will not formally meet during the day, providing the opportunity for all students and faculty members to attend and fully participate. 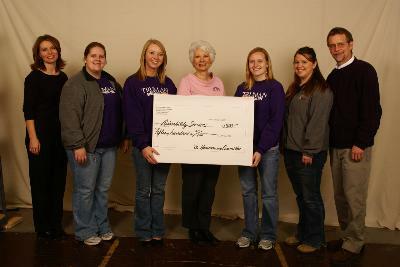 The 2006 Homecoming Committee presented checks to the Kirksville Humane Society and the Truman Student Health Center’s Disability Services office Jan. 19. The committee planned various philanthropic events throughout the week of Homecoming to raise the money for these donations. 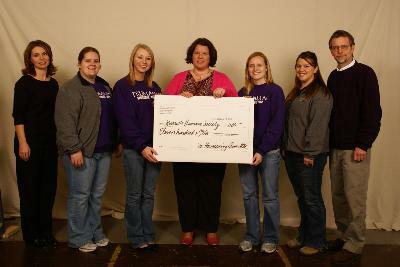 Funds were raised through the sale of Lip Sync and Tru-Stars event tickets, Penny Wars and Parade entry fees. Food donations also made toward Parade entry fees were donated last October to the local Food Shelf and the Humane Society. Overall the committee raised $3,190 in donations. The Truman State University chapter of Alpha Phi Omega (APO) received the Chapter of Excellence Award at the coed service fraternity’s national convention. The local APO chapter sent 35 of its members to Louisville, Ky., for the convention during the week of Dec. 26. There, the chapter was recognized for its excellence in leadership, friendship and service, the fraternity’s three cardinal principles. This award was given to only 21 of more than 200 APO chapters in attendance. 2007 marks the 80th year that Alpha Phi Omega, Epsilon Chapter, has been on Truman’s campus. During this time, the fraternity has completed many service projects on campus as well as throughout the Kirksville community. The group has an extensive volunteer résumé. They sponsored the first American Red Cross blood drive on campus in 1941 and the first Big Event day of service in 2001. Currently Alpha Phi Omega members regularly play “Uno” with residents of Twin Pines Nursing Home, tutor after school at Ray Miller Elementary School and complete thousands of additional hours of service. The organization’s spring rush begins at 8 p.m. Jan. 24 in Violette Hall 1010. 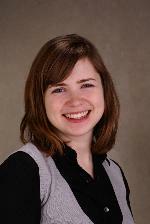 The Public Relations Office has announced Erin Musko, a senior communication studies major, as its intern for the spring semester. Musko is from Webster Groves, Mo., and is a 2003 graduate of Webster Groves High School. She is the daughter of Steve and Bobbi Musko and the youngest of six children. As the intern, she will assist in the writing, producing and distributing of the University newsletter, Truman Today, as well as posting it online. She will also be responsible for editing the calendar on campus Channel 36, writing press releases and performing various office tasks. At Truman, Musko is currently a member of social sorority Alpha Sigma Alpha, communication honors fraternity Lambda Pi Eta and the Advertising and Public Relations Organization. Musko’s interest in written communication and obtaining experience in other various communications outlets has led her to this position. Faculty and staff will soon be able to ship packages from the comfort of their own offices and still benefit from the University discount. The Campus Mailroom has teamed up with UPS to provide UPS Campus Ship. Those who use this service will be able to send and track packages and verify and retain addresses from a PC. It will take a few minutes to set up the computer program and requires about 30 minutes of training. Student workers will pick up the packages with the rest of the mail or the packages can be left in the UPS drop box near the front door of the Mailroom. Those running a little late will also benefit from these changes. If a package is not processed by the time the Mailroom student workers make their rounds or by the 3 p.m. UPS pick-up time, packages can be left in the drop box for a later UPS 5 p.m. pick-up time Monday through Friday. The drop box can also be used to deposit any prepaid ARS labels, preprinted airbills or other prepaid UPS labels. Contact Roger Marsh, director of mailroom services, at 785.4277 or rmarsh@truman.edu for more information. After months of hard work by Information Technology Services, Intramural Recreational Sports is proud to announce a new and exciting program which allows students, faculty, and staff the opportunity to register for intramural sports and events online. ITS developed a program which allows a single team captain to sign-up his/her teammates by using their Truman username. The program will automatically generate an e-mail to each team member explaining which event they have been requested to take part in. This same e-mail will require each member to accept the participation waiver in order to be able to participate. Once all members of a team have accepted the waiver form, the team will be officially entered in the activity. Links for the online registration can be found at http://recreation.truman.edu under the Intramural Registration link. If further information is needed on how to use the program, contact the Intramural Office at 785.4467. Intramural Recreational Sports would like to take this time to thank all those involved with ITS for making this program a possibility. It will make registration for the students, faculty and staff easier and more convenient. The panel exhibit, “The Kirksville Cyclone,” will be on display at the City of Kirksville’s Sesquicentennial Event from 4-7 p.m. Jan. 30 at the Kirksville Arts Association Building. This exhibit was originally created by Truman’s Special Collections staff in the spring of 1999 to commemorate the 100th anniversary of the cyclone that destroyed a large section of the city on April 27, 1899. It is a 16-panel photo exhibit of photos of the destruction taken the day after the storm along side photos of the same sites 100 years later (1999). Text describing the destruction was composed from information in April and May 1899 issues of Kirksville’s three newspapers. A memorial to the 32 people who lost their lives is also included. This was a popular attraction in the Library gallery for several months and was added to Special Collections’ electronic exhibit gallery when taken down. It can now be seen online at http://library.truman.edu/gallery/Tornado/tornado.htm. USA Funds is taking applications for $1,500 scholarships to qualified full-time undergraduate and graduate students and professional students. Applications for the scholarships must be enrolled or plan to enroll in coursework at an accredited two- or four-year college, university or vocational/technical school beginning with the fall 2007 term through Feb. 1, 2008. Application deadline is Feb. 15. For complete eligibility information and to download an application, visit USA Funds’ Web site at http://www.usafunds.org/scholarship. The Alumnae Panhellenic Association of Greater Kansas City is offering educational grants and interest free loans, to female college students who are residents of the greater Kansas City area, attending Kansas or Missouri schools. The Kansas City area is defined as Cass, Clay, Jackson, Platte and Ray counties in Missouri and Johnson, Leavenworth, Miami and Wyandotte counties in Kansas. Applicants must be a senior or graduate level student at the beginning of the next academic year, with at least a 3.0 grade point average. Sorority membership is not required to apply for this program. To be considered for a grant or loan, a completed application form, all required supporting material, and a letter of reference must be on file with the Grants and Loans Committee by Feb. 17. Applications are available online at http://www.kcpanhel.com. The Student Activities Board (SAB) is looking for new members who are bright, detail-oriented, creative, fun and innovative. Applications are due Jan. 24. Applications are available in the Center for Student Involvement (CSI) or in the SAB office. They are due to the CSI and interviews will follow Jan. 26-28. Copies of his most recent book by the same name will be for sale at the presentation. He also will be autographing them. People can view his bilingual online journal, Spirit of Bosnia. Contact Julie Lochbaum at 785.4391 or ctl@truman.edu for more information. Matt Tornatore, professor of foreign language and linguistics, will entertain with his rich repertoire of Italian and Sicilian folklore. As part of his ongoing research, Tornatore plans to spend his sabbatical as a Fulbright Scholar in Sicily next year collecting stories which have been passed down through oral tradition. This work will be done in collaboration with the University of Catania and the Center for Socio-Historic Studies of Sicily. The colloquium is free and open to all and is one of four required events for IDSM 300 credit. Contact Betsy Delmonico at 785.4492 or bdelmoni@truman.edu for more information. Beginning Feb. 1, Mesa Airlines will offer roundtrip flights between Chicago Midway and Kirksville Regional airports. Flights will be available seven days a week. One way tickets start at $101. 50, and roundtrip tickets start at $147.50. Wear anything red and support the fight against heart disease. Heart disease is the No. 1 killer of women. Participate in this campuswide event to promote awareness and prevention. *Captains’ Meeting: Feb. 1 at 4:30 p.m.
An original musical composition by Warren Gooch, professor of music, will be performed at the 2007 Great Plains College Music Society Conference at the University of South Dakota. The composition, titled “MONODIES,” will be performed by cellist Mira Frisch, assistant professor of music, and Gooch as pianist, on April 14. “MONODIES” was selected for performance through a juried national call for scores. Applications for the Sue Shear Institute for Women in Public Life’s 21st Century Leadership Academy are now available at http://registrar.truman.edu/other/shear.html and are due Feb. 23. The Academy is a weeklong, residential college program that encourages students to consider careers in public policy and provides leadership skills training. Applicants must be currently enrolled, degree-seeking students who have expressed interest in women’s public policy leadership and will be returning to Truman for the fall 2007 semester. Contact A. Kay Anderson, registrar, at 785.4143 or aka@truman.edu for more information. DEPThS presents the film “Waking Life” from 8-10 p.m. Jan. 23 in Baldwin Hall 346. Contact Dan Johnson at 785.4922 or dan@truman.edu for more information. The Weekly Lunch Series will begin the semester with speakers Dave Lusk and Roberta Donahue from 12:30-1:30 p.m. Jan. 24 in the Student Union Building Alumni Room. They will talk about preventing alcohol abuse on Missouri’s campuses through a program called MoPip. Sigma Lambda Gamma will have an informational meeting at 7:30 p.m. Jan. 24 in Baldwin Hall 312. Sigma Lambda Gamma is a social, service sorority dedicated to promoting diversity and the empowerment of all women. “Culture is Pride, Pride is Success!” Those who are interested in learning more are welcome to attend. Contact Nohemi Alvarez at na301@truman.edu for more information. The STEP Spring 2007 Academic Year Workshop Series kicks off at 5:30-7 p.m. Jan. 25 in Magruder Hall 1000. Jason Miller will speak on the topic of “Exploring the Transition to Truman: A Discussion for Transfer Students.” Miller will discuss strategies for finding success and a place at Truman. The discussion will be audience driven and address questions about Truman’s academic expectations, extracurricular activities, transfer courses, and campus resources. The Career Center is hosting SCORE mock interviews from 10 a.m.-2 p.m. Jan. 26 in the Career Center. Retired professionals who are members of the Service Corp. of Retired Executives (SCORE) will be conducting mock interviews with one-hour time slots. Upperclassmen who are actively applying to graduate or career schools or searching for a job are encouraged to attend. Prior sign-up, resumé and professional attire are required. Contact Polly Matteson at 785.4240 or pollym@truman.edu for more information. Social, service sorority Tau Lambda Sigma will have Spring Recruitment Jan. 29-31. An informational meeting will take place from 7-8:30 p.m. Jan. 29. Social Night will take place from 7-9 p.m. Jan. 30. Service Night will take place from 7-9 p.m. Jan. 31. All events take place in the Student Union Building Activities Room and all female students interested in joining should attend. Contact Becky Hadley at rlh936@truman.edu or 314.471.5106 for more information or visit the Tau Lambda Sigma Web site at http://tls.truman.edu for more information. 2006 Educator of the Year Plaque Unveiling, honoring Marie Orton, will take place at 4:30 p.m. on Jan. 30 on the 1st floor of Pickler Memorial Library. A small reception with refreshments will follow in Baldwin Hall 100. All students, faculty and staff are invited to attend. Contact Becky Hadley at 314.471.5106 or rlh936@truman.edu for more information. Phi Beta Lambda will host a Spring Rush informational meeting at 8 p.m. Feb. 5 in Violette Hall 1010. Phi Beta Lambda is the largest coed student business organization in the nation. All majors are welcome to attend. Contact Leon Shih at tsupbl@hotmail.com for more information.